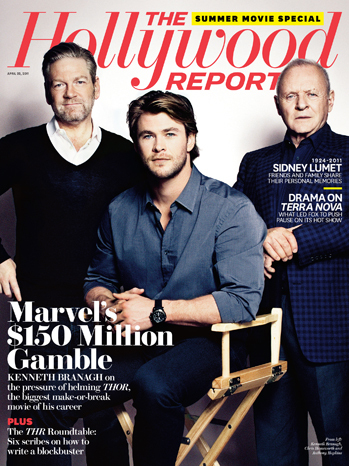 As Marvel’s “most complicated movie ever” hits the big screen, the director, better known for Shakespeare than summer blockbusters, opens up in the new Hollywood Reporter about the $150 million movie that could make or break his storied career. Six warriors charge through a vast golden gate, clad in Viking-like leather and metal, their steeds thundering over a rainbow bridge that will carry them to another world — and freeze. “Hold it right there,” says Kenneth Branagh. He sits at the back of an editor’s dark room, heavy bags of fatigue lining his eyes, chin rested on his hands in thought, as he adds the final touches to his filmed adaptation of the Marvel comic Thor. Even at this stage in late March, just days before he must sign off on the $150 million Marvel Studios/Paramount movie that has consumed him for much of the past three years — and that holds his future as well as an entire franchise at stake — Branagh is reluctant to let go. At 50, with his best-known directing in a decade-old rearview mirror, he’s no longer the wunderkind who earned actor and director Oscar nominations for Henry V before he turned 30. Instead, the art house icon has drawn more acclaim for his recent acting work than for helming — with TV movies and the limited series Wallander. Branagh’s most recent directorial efforts — Sleuth, The Magic Flute and As You Like It, all from 2006-07 — were widely deemed artistic or commercial failures. Indeed, it’s been years since he earned kudos for his most prominent pictures, including 1996’s Hamlet and 1993’s Much Ado About Nothing, and since the studios had him on their A-list for mega-ventures such as 1994’s Frankenstein. Three years ago, the very notion of this renowned Shakespearean actor making Thor seemed academic. The movie had gone through multiple incarnations since the character first appeared in the Marvel comic Journey Into Mystery #83 in 1962. At one point, it was developed at Artisan Entertainment (later bought by Lionsgate), among 10 comic properties the mini-major had obtained, before reverting to Marvel. “There’ve been scripts that we don’t even know about anymore,” says Marvel Studios president Kevin Feige, an 11-year veteran of the company who also produced Thor. Under Feige, Thor went through further drafts. One, written by Mark Protosevich and admired by almost everyone, had its earthly portions set entirely in the Viking era, but Marvel decided this was the wrong way to go. “In that version, Thor is banished from a very foreign world to another very foreign world, which didn’t work,” Feige notes. Marvel proceeded with the material under director Matthew Vaughn (X-Men: First Class), but when Vaughn decided he didn’t want to leave his native England and spend the requisite time in the U.S., the studio had to look elsewhere. Which is when Branagh’s name came up. In Sweden at the time, shooting the first part of Wallander, he began a number of phone and e-mail conversations with Feige, who was initially reluctant to show him the scripts — fearful they might leak on the Internet, Branagh assumes. So in summer 2008, at his own expense, he flew to Los Angeles. After months of talks, the two sides agreed to go ahead, which meant Branagh had to extricate himself from directing Jude Law onstage in the London production of Hamlet. “That wasn’t easy,” he says. “There was an issue of honor” — resolved when director Michael Grandage agreed to take over. In late 2008, Branagh moved to Los Angeles and lurched toward a production slated to start in July 2009. Living close to the sea in Manhattan Beach, ensconced in the Los Angeles area for the first time since he’d made Dead Again two decades earlier, brought back fond memories of superproducer Peter Guber telling him he was sure Branagh would move here for good and a trip with then-wife Emma Thompson to Disneyland, where the roller coasters made both queasy. So working in America was a pleasure– even when Marvel started inundating him with material. Then everything changed: Following the success of Iron Man, Marvel decided to postpone Thor’s release, creating a gap of six months before Branagh would be able to shoot the film. Beneficial for Marvel but not necessarily for Branagh, who was reluctant to be away from home so long. “I seriously considered leaving,” he admits. In the end, he chose to stay, though he did go back to Europe to film a second cycle of Wallander. In October 2009, he returned to Los Angeles full time, and now everything proceeded at warp speed. He kept working on a script that combined the efforts of Ashley Miller & Zack Stentz, J.Michael Sraczynski and Don Payne, with Protosevich brought back for a final polish. Meanwhile, he continued the enormously complex process of casting, which had begun before he left, signing Anthony Hopkins to play Odin and Natalie Portman as Thor’s love interest, Jane Foster. In Branagh’s memory, both hesitated somewhat, though Hopkins recalls it differently. A far greater challenge was casting Thor. In early 2009, accompanied by his casting directors and Marvel executives, Branagh had taken the unusual step of visiting the major agencies to talk about what he was looking for, then watched as hundreds of tapes flooded in. “We started in January and went into April 2009,” he says of the casting phase. After months of searching, Branagh had narrowed his list to four, with each candidate invited to do a screen test. They included Australian Liam Hemsworth — but not his brother Chris, who would eventually get the role. Today, Chris laughs about it, recognizing that he wasn’t in top form when he first met Branagh and noting that his younger brother gave him tips based on everything he’d gleaned through the auditions. “We’re competitive, but in the best way,” he says. This time, Branagh knew he’d found his man. Hemsworth impressed not just Branagh but also Marvel, critical for a movie of Thor’s scale. “When you are spending this much money and looking for a franchise, you have to run it up the flagpole,” Branagh notes. With his Sleuth cinematographer Haris Zambarloukos onboard, shooting finally got under way in January 2010 on Marvel’s soundstages at the Raleigh Studios in Manhattan Beach, then in March moved to Santa Fe, N.M., where the earthbound part of the movie is set. Luck was on Branagh’s side: Other than a bout of bad weather, the shoot went without a hitch. The 90-day shoot wrapped in April. Then Branagh embarked on almost a year of postproduction that’s in its final stages as we speak. By press time, he’ll be done. Then he’ll just have to stand back and wait until Thor premieres April 21 in Australia, two weeks before it opens domestically, to see if his years of endeavor pay off. It is hard to imagine branagh would have been so composed earlier in his career, a brilliant young man in a hurry. His first inklings of ambition came when he was uprooted from his native Belfast, Northern Ireland, moving to the English town of Reading at age 9 as his working-class parents fled “the Troubles.” It was the first upheaval in his life. The version he constructed was of Branagh the actor, and it proved so concrete that he won acclaim almost as soon as he graduated from the Royal Academy of Dramatic Art. That was when he launched on a storied career, playing the title role of Henry V onstage while still in his early 20s, creating his own theater company and earning those dual nominations for his 1989 adaptation of Henry V.
Branagh was far too ambitious for the staid world he inhabited — though he says ambition wasn’t his main thrust. Further success with 1991’s Dead Again and Much Ado About Nothing and his marriage to Thompson didn’t quell the envy. Then came the failure of Frankenstein, and Branagh’s directing career stumbled. No longer the boy wonder, he was soon seen as part of the establishment — respected and admired but not quite the rock star he’d been. Opportunities to direct big films came his way, but he turned them down, favoring stage work including a production of Chekhov’s Uncle Vanya that brought him back to Belfast. Munching on a sandwich in a tiny office after we leave the editing room, he reflects on that time — not just on his choices but also, strangely, how little joy his biggest triumphs brought him. He says he’s grown from the person who wrote in his late 20s that a “sense of achievement was something that I almost consciously denied myself.” Joy is something he experiences much more readily now. Living with his second wife, art director Lindsay Brunnock, and their dog in a country house outside London, there’s a modest, very human quality to him that seems far removed from the somewhat cocky young man who wrote his autobiography at age 28. This meditation helped him cope with his parents’ deaths — his mother’s in 2004, his father’s in 2006. Branagh had been close to both, but their illness also had tied him to home and been a key factor in his decision not to move to Los Angeles. Now, he realized, he not only had the freedom to travel but also to explore new horizons, new worlds, that might have conflicted with their expectations. In other words, allowing Thor. So why is it one senses something is wanting? None of this will change unless Thor succeeds, and maybe not even then. Branagh is already at work on other projects — The Boys in the Boat, about a champion rowing team that competed in the 1936 Berlin Olympics, and Italian Shoes, about an isolated old man who has to fulfill one last request — which may reteam him with Hopkins — but Thor has to deliver if he wants to come back to the epicenter of Hollywood. That won’t be the aberration it seems.